The head priest in the Kali Temple, close to Mother Theresa’s Home for the Dying in Calcutta, led a public protest against her. Despite the stones and insults, she continued her work with the Missionaries of Charity, which she founded in 1950. Later, the same priest was dying of leprosy. He was shunned by fellow priests and put out in the streets by his own family. When she heard about it, she went out looking for him... then took him in and tended to him herself, without a word of reproach. There were times when she did not feel God’s presence. Like the poor of Calcutta, her soul seemed empty. God was testing her. Her faith never left her. 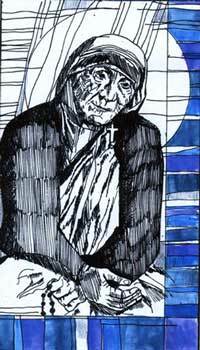 She continued to yearn for God and to work with the destitute until her death September 5, 1997.
insensitivity to the plight of the poor. Try to see Christ in the Throw-Away People of your world. Do what you can to help them. Prayers and kind words go a long way. Remind the hurting and the troubled that God loves them. They don't know me, so they don't love me.